At first glance both the QX10 and QX100 look like conventional lenses for an SLR (single lens reflex) camera but there’s more to them. They are essentially compact digital still cameras without screens and control buttons. Behind the lens in each of the devices is a image sensor—the chip found inside every camera that converts light to an electronic image, an image processing chip and a WiFi adapter. Both come with a clip that can be used to mount them to a smartphone and it’s software in the smartphone that is used to control them and replace the viewfinder. The idea is that users get the best of both worlds—compact digital camera quality images with the advantages of smartphone photography, such as the ability to instantly upload or share pictures. But what’s the reality? I took the QX10 out for a test at IFA and here’s what I found out. One of the first things you’ll need to do is download Sony’s PlayMemories software. It’s available for Android and iOS and is used to control the QX10 and QX100. It needs to be paired with the lens using a password that is printed on the manual or inside the battery compartment lid on each lens. The connection is made over WiFi Direct or, if the phone supports it, NFC (near field communication). Once the software is installed, you’re ready to start snapping pictures. 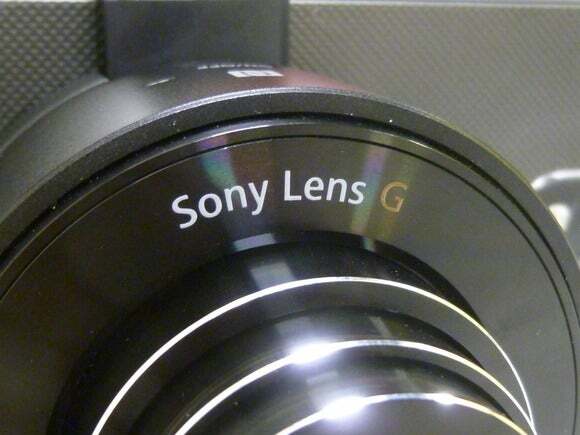 Sony’s QX10 lens camera is mounted on a Galaxy Nexus smartphone here. I tried it on my Galaxy Nexus, an Android phone from late 2011. Clipping the lens onto the phone was very easy and at 90 grams, the QX10 didn’t end up making the 135-gram phone front heavy. I found it easiest to hold the phone by grabbing the lens body as I walked around taking pictures. The software shows a live image and has on-screen zoom and shutter controls, but I found it easier to use the physical zoom and shutter buttons on the side of the QX10. The camera can be focused by tapping on any area of the live image, much like the camera software in most smartphones. It also provides some of the settings you’d normally adjust through a camera’s menu including the shooting mode, white balance, picture size and quality, exposure control and ability to automatically transfer a review image (either a 2-megapixel version or the original) to the phone after each picture is taken. The actual images are stored in a microSD card that fits into the QX10 alongside its battery. There wasn’t much of a perceptible lag in the live image, but it wasn’t always smooth when panning from side to side. It took about four seconds from the button being pressed to the picture appearing on the phone screen. That’s slower than a digital still camera, but then the QX10 is a compromise between two devices and it does that quite well. It did great in bright light and low light—the intelligent auto mode will take several pictures and merge them when there’s not enough light—but some of the pictures seemed to lack a little of the brightness and color that came from a compact digital camera when I took comparison images. However, that’s not to say the QX10 pictures were bad. I found it useful to have a lower resolution version of each picture sent to my phone. They are not too large for the phone to handle and perfect for sending to social media channels or attaching to emails. I’ve never been able to take such high quality photos with my cellphone, so for that the QX10 is a winner. If you like to take pictures and are always disappointed by the camera on a smartphone then the QX10 and sister QX100 are worth considering. But if you’re more serious about taking pictures, you might want to stick to your digital camera. The QX10 and QX100 will be available from late September. In the U.S., the QX10 with 10x optical zoom is expected to cost $250 and the QX100, which has a 3.6x zoom and larger image sensor, expected to cost $500. Updated at 9:41 a.m. PT to include a video report from IDG News Service.